Although plastic laminate and melamine are common materials, not everyone knows the difference. Both materials are used to cover substrates such as particleboard, MDF and plywood for use in cabinets and countertops. Both materials provide outstanding protection for the substrate. Melamine, also known as Medium Density Laminate – MDL, is a resin coated paper that, in many instances has a printed pattern on it. (Left panel in the photo) Plastic laminate, also known as High Density Plastic Laminate – HDPL, begins with a resin coated paper very similar to a melamine and is backed with phenolic resin layer, typically between 1/32” and 1/16” thick. 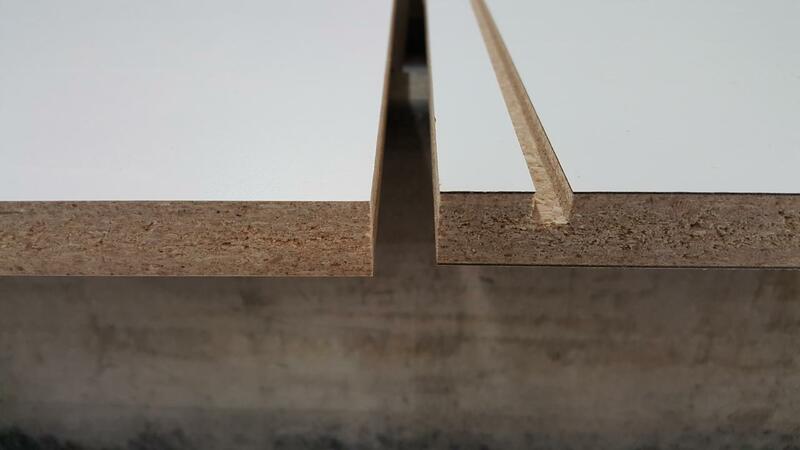 (Right panel in the photo) Although plastic laminate does have very strong qualities, the printed paper layer in plastic laminate is similar in thickness to melamine and therefore can be compromised with the same amount of wear. Plastic laminate is typically available in more colors and patterns than melamine and for that reason is very commonly specified for the exterior of commercial cabinets. Melamine is commonly used for interiors of cabinets and is far less expensive. Price, style and function need to be considered when considering which materials are needed for cabinet construction. If you have any questions about when and where each product is best used, feel free to call or email us at Bledsoe Construction to discuss your specific project.